Expression of a single gene dramatically decreases synaptic connections between brain cells. Yale scientists believe this may explain why people suffering from chronic stress and depression suffer loss of brain volume. A new study by Yale University scientists found that GATA1 represses the expression of several genes that are necessary for the formation of synaptic connections between brain cells and that GATA1 may play a role in symptoms of depression. Major depression or chronic stress can cause the loss of brain volume, a condition that contributes to both emotional and cognitive impairment. Now a team of researchers led by Yale scientists has discovered one reason why this occurs — a single genetic switch that triggers loss of brain connections in humans and depression in animal models. 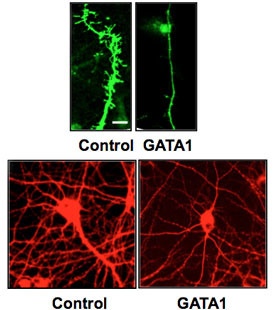 Be the first to comment on "GATA1 Plays a Role in the Loss of Connections between Neurons and in Symptoms of Depression"